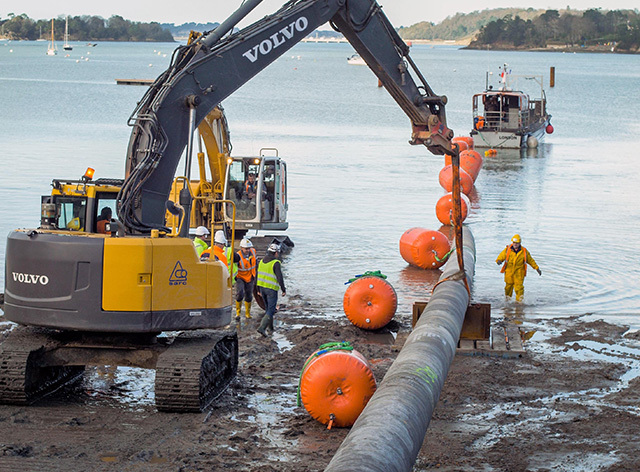 Our Buoyancy and Ballast division does not just get involved with the installation of oil and gas pipelines – our buoyancy modules are also very often used in the installation of water pipelines. Since the start of 2018, 150 of our 1t MBUs have been on site in Northern France assisting with the floating into position of a new potable water pipeline near to St Malo, at the mouth of the Rance. Client: SARC. Subsea work: SM2P (Groupe GSLC). Engineering study and co-ordination of nautical and subsea work : Group GSLC. Image courtesy of Askell Drone.